Can systems built today cope with tomorrow’s weather extremes? The extreme weather of 2012, which exposed a number of limitations in the nation’s grid infrastructure, was a climate change wake-up call for the electric power industry. Two nuclear power plants in New England were forced to shut down due to the temperature of their cooling water supplies.1 Drought in Texas led the North American Electric Reliability Corp. to report concerns about the state’s ability to maintain adequate reserve margins.2 Then there was Superstorm Sandy. In addition to devastating the Long Island coastline, New York City boroughs, and New Jersey coastal areas, the storm disrupted power supplies for millions of residences and businesses. These events are a harbinger of what can be expected in the decades ahead. While the details will vary from place to place, in general climate change will lead to more extreme heat waves, higher water temperatures, more severe droughts, and more extreme storms.3 These events will increasingly stress an aging power grid that was designed largely on the assumption that future weather would be similar to that of the past. Moreover, climate change isn’t occurring in isolation but is accompanied by technological advances, an evolving regulatory environment, and long-term trends in the supply, demand, and prices of different fuels. We have an opportunity to increase the resilience of the nation’s energy system by accounting for climate change during the ongoing modernization and build-out of the nation’s grid infrastructure. However, to do so, there’s an urgent need for new, more integrated tools that account for the complex interactions among climate, water, energy, and other systems. Looking forward over the next 50 to 100 years (the time horizon relevant for large infrastructure investments, such as transmission lines and large thermal power plants), the magnitude of climate change will depend, to a large extent, on the amount of heat-trapping greenhouse gases emitted by future human activities, as well as on the exact sensitivity of the climate system to those emissions. 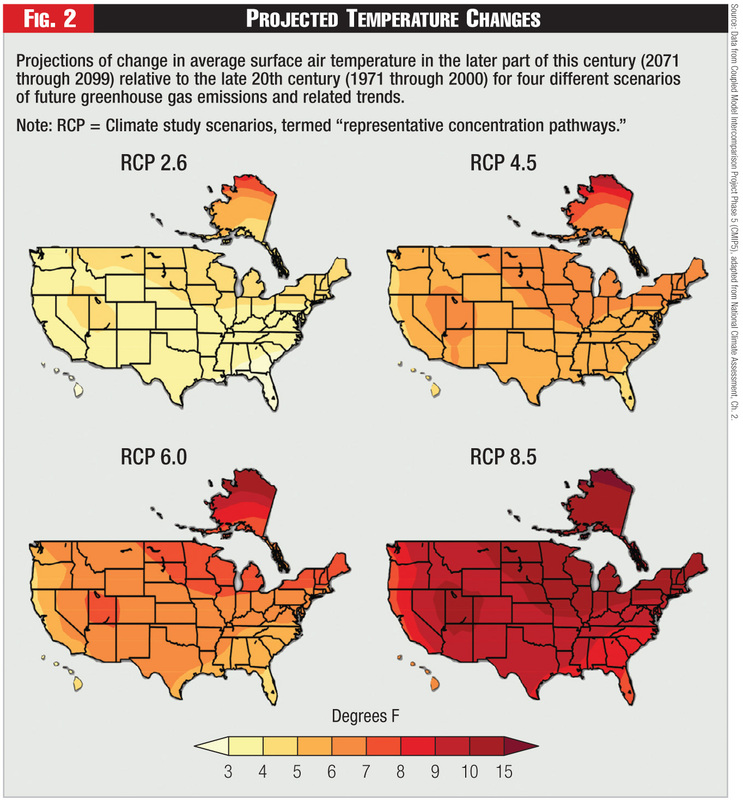 Figure 2 shows the projected future warming for the United States under four different scenarios of future greenhouse gas emissions and related trends. 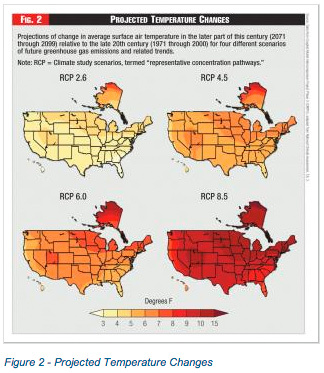 The color transitions in this figure are “smoother” than in Figure 1 because the climate models used to make these projections can’t simulate every detail of how climate change will play out at a particular location. Still, these models can reliably project large-scale, long-term temperature trends for a given emissions scenario, and all of these scenarios show significant additional warming for all regions of the United States. 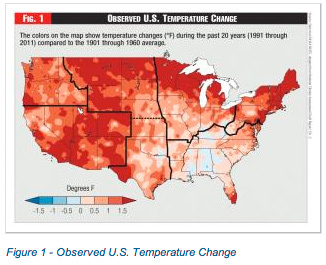 As average temperatures increase, the frequency and intensity of heat waves also can be expected to increase.6 For example, “rare” heat waves – those currently only expected to occur once every 20 years – are projected to happen at least every other year over the entire lower 48 states by mid-century with even sharper increases in the South and Southwest.7 Heat waves with unprecedented temperatures and durations also will occur with increasing frequency, especially if greenhouse gas concentrations continue to rise unabated. When considering the effects of temperature change on the U.S. energy system, it’s these sharp increases in the frequency, duration and intensity of heat waves that generally pose the biggest threats to reliability. High air temperatures affect the electricity sector in a number of ways, such as increased air conditioning driving up power demand. This effect is accentuated on very hot days after a heat wave, which slowly increases the temperature of the entire thermal mass of commercial buildings. High air temperatures also reduce the supply of electric generation capacity from natural gas-fired combustion turbines and combined cycle power plants by up to 20 percent, because warmer air is less dense and provides less oxygen for the combustion. This reduction in electricity supply typically occurs simultaneously with the load increases associated with increased air conditioning demand. 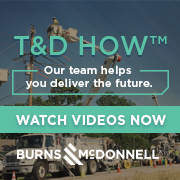 Extreme heat also causes transmission and distribution lines to expand and sag, decreasing the amount of power that can be transported through the lines and further reducing the system’s flexibility in meeting increased demand. Heat waves represent a multifaceted stress on the entire electric grid. The nation’s electricity system has been designed to operate with a reserve margin large enough to account for these temperature-related effects. However, these design criteria usually are based on analyses of historical weather conditions that might not apply in the decades ahead. 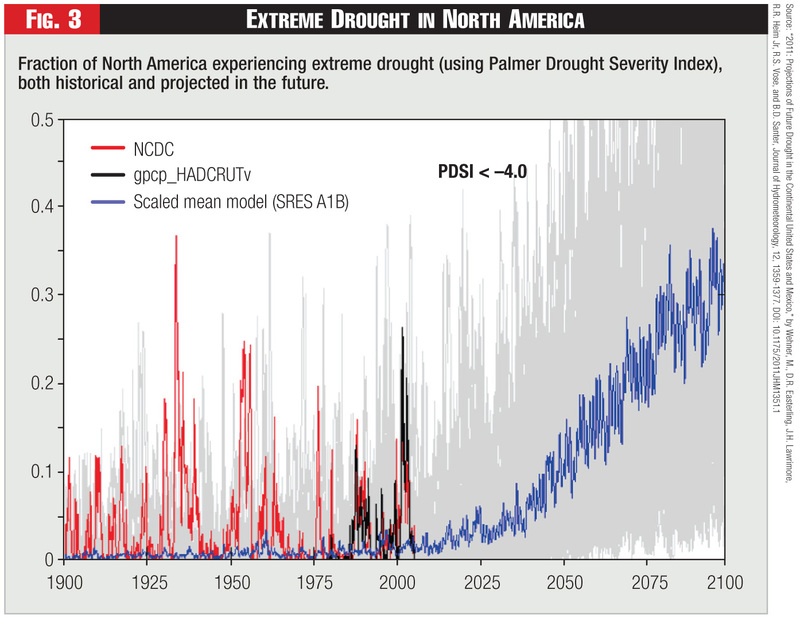 While projected changes in precipitation are less certain than projected changes in temperature, climate change generally is expected to enhance hydrological extremes. The frequency and maximum intensity of strong precipitation events will increase, and regions prone to dry spells could experience longer and more intense droughts in the future.8 There’s already been a notable increase in the fraction of total rainfall falling in the heaviest precipitation events across much of the United States.9 This increase can be mostly attributed to the simple fact that warmer air can hold more water vapor. Extreme precipitation affects all kinds of physical infrastructure, especially when accompanied by high winds or storm surge, as seen with Hurricanes Sandy and Katrina. Impacts on the electric power sector can range from disruptions of fuel supply to inundated power plants to downed substations and distribution lines. Although the frequency and peak intensity of the strongest precipitation events are expected to increase, future trends in the frequency and intensity of hurricanes and other organized storm systems are less clear. As a result, there are relatively few locations where climate change-driven changes in extreme precipitation are clearly exacerbating electricity system vulnerabilities. One such place is the Gulf Coast, which is dealing with a combination of sea level rise, widespread land subsidence, increasing hurricane intensities, and a large number of low-lying power plants and other energy infrastructure. On the other hand, droughts can dramatically affect power generation and are projected to increase in frequency and intensity across many parts of the United States. This sensitivity was illustrated by the recent droughts in Texas, Georgia, Alabama, and the upper Midwest.10 Nationwide, the electric power sector currently withdraws 143 billion gallons (540 million cubic meters) of freshwater every day from rivers, lakes and aquifers for cooling nuclear, coal, and natural gas power plants,11 and consumes 2.2 to 5.9 billion of those gallons (8 to 22 million cubic meters)12 Withdrawals and consumption vary widely across different types of power plants. Sixty-seven percent of the water withdrawal is by coal-fired thermal plants, mostly in once-through cooling designs, whereas 63 percent of the water consumption is through evaporation in large cooling towers. Competition for water resources – most notably with agriculture – also varies widely, although it’s already a significant issue in many parts of the country.13 Changes in water demand and water availability, whether due to changes in climate or other ongoing trends, will have different effects and require different responses in different regions. (See Figure 3). Lower water levels and higher air temperatures tend to increase water temperatures, especially when droughts occur in combination with heat waves. Water temperatures are closely monitored by the Environmental Protection Agency and other regulatory agencies because excessively warm water can significantly impact aquatic life. In 2012, high water temperatures led the Illinois power industry to request 29 provisional variances from thermal discharge regulations. In some cases, the in-stream water discharges approached 100 degrees.14 Warmer inlet water also has a negative impact on the thermodynamic efficiency of thermal power plants by reducing the heat rejection of the steam cycle. Warmer water has the potential to be an even bigger challenge for power production than the direct impacts of increasing air temperatures or changes in water availability. Although comprehensive metrics don’t yet exist, a variety of evidence suggests that changes in water availability – due to drought, high water temperatures, shifts in seasonality, competition from other sectors, changes in groundwater availability or other factors – are already stressing the nation’s electricity system. The Union of Concerned Scientists reported that in the last six years (2006 through 2012), seven large base load power plants experienced insufficient water for cooling for some time during the summer, 12 plants were derated because discharge water temperatures were too warm, and eight plants had incoming water exceeding the permissible temperature for safe operation.16 Additional data and improved tools for projecting future water availability are needed to get a better handle on how quickly these numbers might increase in the decades ahead and to assess the various measures that could be taken to mitigate water-related risks to power production. Discussions with stakeholders in different regions17 have indicated a critical need to better understand the implications of climate change for electricity system design and operations. Some of these concerns are regional, while others are more widespread. Discussions with a Texas utility, for example, revealed that ensuring adequate water supplies for large thermal plants is their primary concern. Utilities and grid operators in the Midwest and interior Southeast have indicated an interest in understanding the combined effects of heat waves and droughts, including not only water availability for large base load power plants but also how changes in air temperatures will affect loss-of-load probabilities. Many utilities along the Gulf Coast are concerned about hurricanes and their attendant storm surges and wind damage, but moving these power plants inland could raise water availability issues – an illustration of the complex tradeoffs and interactions that must be dealt with when trying to reduce electricity system vulnerabilities. In addition to changes in temperature, water availability and other climatic factors, additional trends further complicate assessments of the climate footprint on energy and the development of potential response options. Changes in population, penetration of renewable energy technologies, energy efficiency improvements, different market structures, and the sharp uptick in domestic natural gas production are all having a significant impact on the capacity expansion, operation and resilience of the grid. Many of these trends are mutually interdependent. For example, some competition for water resources comes from bioenergy crops or fracturing operations.19 In August 2011, Pennsylvania suspended water withdrawal permits to 11 natural gas projects, while water agencies in Texas noted that the severe drought in the region made them consider how to allot such permits. Disruptions to fuel supply are an additional complication, including not only short-term shocks associated with natural disasters such as earthquakes and hurricanes, but also predictable weather-sensitive effects, such as insufficient natural gas pressures during cold snaps in the Northeast. The restructuring of electricity markets is another notable trend, which, in general, has led to greater competition and overall improved system efficiency due to higher utilization of infrastructure investments. Higher utilization, however, also tends to reduce the flexibility to cope with extreme events and unforeseen conditions. To offer an example from a different sector, the airline industry increased its airplane utilization or load factor from about 70 percent in 2000 to more than 80 percent in 2010, resulting in fewer empty seats, on average, per flight.20 While this has increased the system’s average efficiency, the reduced number of empty seats has increased the time it takes to return the system to normal operations after severe weather or other disruptive events, especially events such as snowstorms that affect wide regions and leave many passengers stranded. While this doesn’t mean that the system is operating less safely, it does indicate that weather can significantly affect travel time. Similarly, we expect the electricity industry will need to address the effects of severe weather conditions in the context of economic realities. The industry should also adopt resiliency criteria for the design of distribution and transmission systems and siting of new power plants that balance these competing demands. Otherwise, effects are likely to affect larger regions and restorations could last much longer. Currently, the electricity planning and operations communities don’t account for climate change in many of their decisions. For example, load growth projections for transmission and capacity expansion planning typically are driven by economic growth indices, energy efficiency projections, and some load profiling with little or no considerations of how air temperatures or building cooling technologies might change. As a result, we’ve been learning the hard way about how fragile our infrastructure really is and how costly restoration of basic services can be after major climatic events. A number of actions can be taken to mitigate the effects of climate change on the nation’s energy system. In general, these actions focus on decreasing vulnerability or improving the resilience of the system to stresses. Although there are important tradeoffs involved, many of these actions and strategies potentially could yield additional benefits in terms of system reliability, emissions reductions and overall effects on the environment. If widely adopted during the siting and construction of new facilities or the rebuilding of old ones, especially following a climate-related disaster, such a strategy could dramatically reduce the exposure of the nation’s electricity infrastructure to climatic risks over time. Another general strategy for reducing the vulnerability of the electricity system to climate change is to harden existing infrastructure. This includes, among other options, flood-proofing infrastructure by building floodwalls around them or wind-proofing overhead distribution lines. The adoption of less water-intensive thermal power plant designs, especially in regions projected to see decreases in water availability, is another strategy for reducing climate-related vulnerabilities. However, these modifications can be expensive and could reduce overall plant efficiency because they require more ancillary pumps and fans for heat transfer. The other general category of actions that can be taken to lessen the effects of climate change on the energy system is to improve system resilience, typically by enhancing flexibility or redundancy. For regions where water availability is highly variable or where future changes are uncertain, it might be desirable to provide multiple cooling options such as evaporative or dry-cooling. This will provide options for different cooling technologies, depending on conditions. Although this still would incur higher up-front costs, such a strategy would permit the use of less water-intensive operations when water availability is reduced, while also allowing more efficient operations during times when supplies are adequate. The trend toward distributed generation also could enhance system resilience to climate change and other kinds of disruptive events. In particular, a balance between large central-plant grid topology and some distributed energy resources, such as small combined heat and power technologies and small dispersed photovoltaic systems, would reduce the risk of system failure due to a single-point failure outage. The promise of storage technology and deployment of smart grid technologies will improve not only systems efficiency, but also the ability of the electricity system to cope with extreme events, fuel supply disruption, and other unforeseen occurrences by enabling more operational transparency and flexibility to reconfigure the grid for fault isolation and rapid restoration. One key issue underpins nearly all strategies for reducing vulnerability and improving the resilience of the energy system to climate change: the ready availability of robust, relevant and easily accessible information that can inform and influence decision making. Such information might include data about regional-scale temperature and precipitation changes, which are far less certain than global temperature trends, making it difficult to assess the potential exposure of a particular facility or portion of the electricity system to those changes. Better tools also are needed to assess the vulnerability of the energy system to both climate change and other, related changes in human and environmental systems. Moreover, even if the exact nature of future climate change were known, today it’s difficult to evaluate the potential efficacy of different options that might be taken to respond. Of course, these difficulties don’t mean that nothing is known, that climate risks can’t be accounted for, or there are no actions that could be taken to improve resilience to climate change while yielding other benefits. They do suggest, however, that more sophisticated tools and analyses are needed to inform all aspects of energy production and use in the context of evolving climatic conditions. In a recent report, the U.S. Government Accountability Office highlighted the interdependencies between water supply and electricity production. It urged the Department of Energy to allocate resources to improve our understanding of these linkages and provide insights that could be used to inform power plant siting decisions and overall system operations improvements with an ultimate goal of making the electricity system more resilient.22 So there’s growing recognition of the problem. However, the GAO report also acknowledges that improving system resilience will be difficult, particularly due to a lack of pertinent data and integrated modeling capabilities that can assess cross-sectoral objectives and constraints. What the electric power sector really needs is a consistent and actionable design, planning, and operations framework that addresses new extreme weather events and climate change scenarios along with other ongoing trends in a robust and integrated way. Tools are needed, for example, that can evaluate different alternatives, characterize uncertainties and risks, and provide a comprehensive examination of tradeoffs and co-benefits. In addition to informing infrastructure planning, design, and operations, tools need to inform regulatory approaches, policy actions, and other processes and decisions that affect the nation’s energy sector. These tools must account for important regional and sub-regional differences in energy and environmental systems, as well as national energy security goals and objectives. While such tools don’t currently exist, efforts now are under way to develop them. Several groups have developed tools that can link information about the physical climate system – for example, projected sea level rise or changes in cooling water availability – with information about the energy system. The current challenge is developing more complex and integrated models that can simultaneously represent changes in multiple systems and allow for the evaluation of different potential response options. Ideally, an analyst should be able to estimate the likelihood and implications of a scenario like this: during a prolonged drought that reduces the availability of cooling water, a stationary high pressure system over a region brings unprecedented high temperatures, driving record energy demand – while simultaneously reducing the air movements needed to drive wind power. This analysis would require sophisticated representations of regional weather patterns, regional hydrology, and regional electricity supply, demand, and operations – a suite of inter-related analyses that have never been done before. Ultimately, such an analysis should also account for long-term trends in population, energy technologies, fuel prices, and regional energy mix, as well as changes in climate and other systems that affect energy supply and demand. Preliminary steps to develop these integrated modeling tools are being taken by national laboratories and several universities. While these models are under development in the science community, it will take many years to validate them for use in the electricity industry. They also will require considerable investments in science and data collection to better understand the various processes and interactions involved and develop robust, validated tools that provide timely and relevant information for decision makers. Every day, we’re designing and building billions of dollars in electricity infrastructure, but often without a full appreciation of the risks that climate change poses to those investments, or of possible steps that could be taken to mitigate those risks. Decision makers in New York State, for example, are evaluating the resilience of their electricity infrastructure as they rebuild and restore the grid in the wake of Hurricane Sandy. However, the new design criteria are unclear regarding how to define sufficient protection against climate-related threats. This lack of clarity stems, in no small part, from the dearth of tools available to project future risks and evaluate different response options in a robust and integrated way that accounts for the multiple, interacting changes taking place. One advantage the electricity industry might have over other sectors affected by climate change is that it’s learned to work with a statistical representation of capacity availability. Contingency analyses already are performed for stochastic processes, such as disruption of natural gas supply to power plants, or to account for the variable contribution of renewable sources, such as wind and solar, to the system. The same sort of approaches potentially could be applied to account for the effect of climate-driven changes in extreme events on existing infrastructure. An even more valuable development for improving overall grid resilience would be applying these tools to capacity expansion planning in a manner that accounts for demand growth, supply changes, and other trends. Conversely, there are many challenges and uncertainties that must be accounted for when trying to reduce energy system vulnerability or enhance its resilience. Perhaps the most difficult challenge for the planning process is to comply with the intertwined web of rules and regulations across multiple sectors having authority over water, plant siting, land use, and emissions. The planning process and necessary support tools will need to account for disparate compliance issues and to facilitate a comprehensive tradeoff analysis where many scenarios can be explored to gain insights into the sensitivity of certain key assumptions toward the overall planning outcome. Robust, integrated electricity planning tools that account for all of these factors will take time to be developed, tested across a wide range of possible future conditions, and deployed in different regions. In the meantime, it appears our efforts should focus on enhancing resilience of the electricity infrastructure as the best way of dealing with a future that will be unlike the past. The year 2012 marked our wake-up call. We can take steps to anticipate future stresses and enhance our resilience, or be surprised and deal with the consequences. The choice is ours. Michael Kintner-Meyer is an engineer in the Energy and Environment Directorate at Pacific Northwest National Laboratory, and is responsible for grid analytics at the Laboratory. Ian Kraucunas is deputy director of PNNL’s Atmospheric Sciences and Global Change Division, and leads PNNL’s Platform for Regional Integrated Modeling and Analysis (PRIMA) initiative. Previously he was a senior program officer with the Board of Atmospheric Sciences and Climate at the National Research Council. 1. 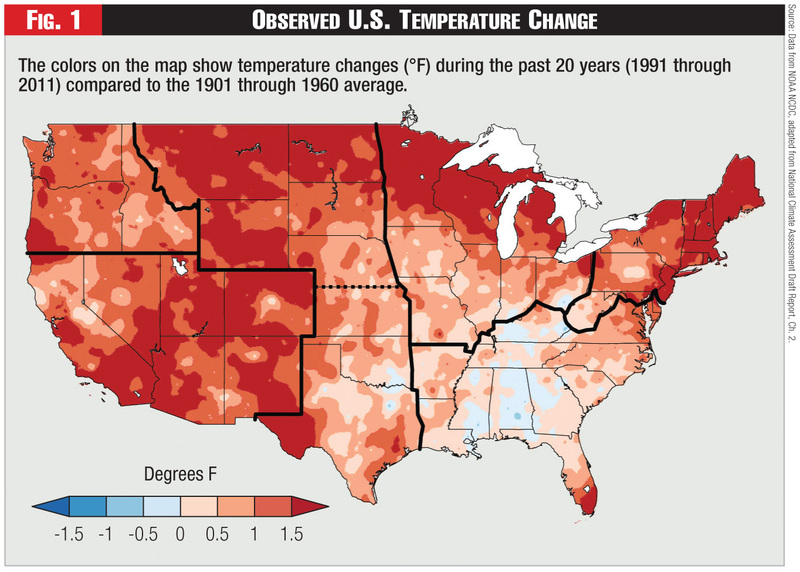 “Record Heat, Drought Pose Problems for U.S. Electric Power,” by Eaton J., National Geographic News, Aug. 17, 2012. 2. “2012 Summer Reliability Assessment – Seasonal Outlook,” North American Electric Reliability Corp. (NERC) 2012. “Drought Could Pose Problems for Texas Power Plants.” Galbraith K., The Texas Tribune, Sept. 16, 2011. 3. IPCC, 2012: “Summary for Policymakers,” in “Managing the Risks of Extreme Events and Disasters to Advance Climate Change Adaptation,” A Special Report of Working Groups I and II of the Intergovernmental Panel on Climate Change, Field, C.B., V. Barros, T.F. Stocker, D. Qin, D.J. Dokken, K.L. Ebi, M.D. Mastrandrea, K.J. Mach, G.-K. Plattner, S.K. Allen, M. Tignor, and P.M. Midgley (eds. ), Cambridge University Press, Cambridge, England, and New York, pp. 1-19. 4. IPCC, 2007: “Summary for Policymakers,” in “Climate Change 2007: The Physical Science Basis,” Contribution of Working Group I to the Fourth Assessment Report of the Intergovernmental Panel on Climate Change, Solomon, S., D. Qin, M. Manning, Z. Chen, M. Marquis, K.B. Averyt, M. Tignor and H.L. Miller (eds. ), Cambridge University Press, Cambridge, England and New York. 5. Draft Climate Assessment Report, National Climate Assessment and Development Advisory Committee (NCADAC), 2013. 7. “Increasing prevalence of extreme summer temperatures in the U.S.,” by Duffy PB and C Tebaldi, Climatic Change 111(2):487-495. DOI: 10.1007/s10584-012-0396-6, 2012. 8. Managing the Risks of Extreme Events and Disasters to Advance Climate Change Adaptation, CB Field, V Barros, T.F. Stocker, D. Qin, D.J. Dokken, K.L. Ebi, M.D. Mastrandrea, K.J. Mach, G.-K. Plattner, S.K. Allen, M. Tignor, and P.M. Midgley (Eds. 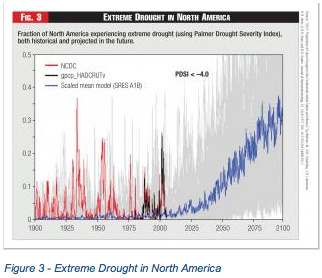 ), Intergovernmental Panel on Climate Change, 2012, Cambridge University Press, Cambridge, England. 10. “The Impact of the 2011 Drought and Beyond,” Combs S., Comptroller of Public Accounts, Publication #96-1704, Austin, Texas, 2012; “Lessons Learned? How Drought Has Shaped Water Policy in Georgia,” by Walton B., Circle of Blue, July 02, 2012. 11. “Estimated Use of Water in the United States in 2005,” United States Geological Survey (USGS Circular 1344), 2009. 12. “Freshwater Use of U.S. Power Plants: Electricity’s Thirst for a Precious Resource,” Union of Concerned Scientists, 2011. 13. Evaluating Sustainability of Projected Water Demands under Future Climate Change Scenarios, prepared by Tetra Tech Inc. for the Natural Resources Defense Council, 2010. 14. Meeting Notes of the State of Illinois Drought Response Task Force, Oct. 17, 2012. “Power plants releasing hotter water: State issues exemptions; environmentalists worry about fish,” by Meyer E. and J. Wernau, Chicago Tribune, Aug. 20, 2012. 15. “The Washington Climate Change Impacts Assessment: Evaluating Washington’s Future in a Changing Climate,” Climate Impacts Group, University of Washington, Seattle, Wash., 2009. 16. “The Energy-Water Collision,” Union of Concerned Scientists, Sept. 27, 2012. 17. “Incorporating Stakeholder Decision Support Needs into an Integrated Regional Earth System Model,” by Rice J.S., R.H. Moss, P.J. Runci, K.L. Anderson, and E.L. Malone, Mitigation and Adaptation Strategies for Global Change 17(7):805-819. DOI: 10.1007/s11027-011-9345-3, 2012. 18. “Death Toll exceeded 70,000 in Europe during the summer of 2003,” Robine, J.-M., et al., Comptes Rendus Biologies, Vol. 331, Issue 2, Feb. 2008, pp. 171-178, Elsevier Publishing. 19. “Hydraulic Fracturing and Water Resources: Separating the Frack from the Fiction,” by Cooley H. and K. Donnelly, Pacific Institute, Oakland, Calif., 2012. 21. Supplemental Staff Guidance to NUREG 1555, “Environmental Standard Review Plan,” (ESRP) for Consideration of the Effects of Greenhouse Gases and of Climate Change, Nuclear Regulatory Commission (NRC), Exhibit #NRC106-00-BD01, Docket #07007016, 2012. 22. Energy-Water: Coordinated Federal Approach Needed to Better Manage Energy and Water Tradeoffs, U.S. Government Accountability Office, GAO-12-880, September 2012.